The Goodwood race course is a very renowned racing track for horses. It is located five miles towards the northern side of Chichester in England. The duke of Richmond and his family control the whole Goodwood horse racing game, and their seat is very near to Goodwood house. They take pride in hosting the world’s glorious and famous Goodwood meetings annually. It is considered as one of the most important events in the British calendar of flat racing. It is the native home of UK’s 31 Group one flat races which are namely Sussex stakes and the Nassau stakes. Goodwood is considered as one of the most important and valuable flat horse racing course for the local officers. It conducts extremely colorful events and provides entertainment to thousands of people. Goodwood ranks first when it comes to Britain’s precious estates and historical homes. The Goodwood horse racing began when the third duke of Richmond started the game in Goodwood in order to benefit the officers belonging from the Sussex militia. The duke was the colonel of that time. Previously the annual races were held by the officers near the Petworth Park under the supervision of the Earl of Egremont. But due to the extreme atrocious and untamed behavior of the Earl, the invitation was asked to be withdrawn. At that time the duke of Richmond came up with the idea of introducing a race course in the estate of Goodwood which is popularly known as the Harroway. The Goodwood race course has got three phenomenal enclosures which are elaborated below. The Richmond enclosure is considered to be the best when it comes to Goodwood horse racing. It is the premium ground for the race. The enclosure consists of the stylish and fashionable bars with the champagne lawn. It also has got several restaurants, the 1812 bar and provides awesome vantage point. You can view the racecourse and the parade ring. The sight opposite of the winning post can also be seen from this enclosure. The members will have to follow a dress code in order to be allowed in this enclosure. They also have to enter the other two enclosures. 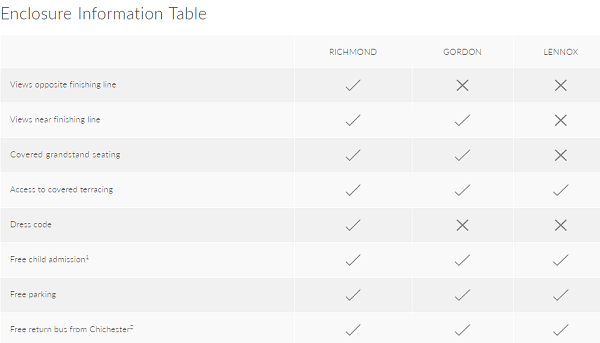 The Gordon enclosure is less formal when compared to the Richmond enclosure. They can have a good vantage point of the race by standing within the March grandstand. They can also view the Goodwood horse racing from the winning post. This enclosure also consists of the bars and the private boxes. It also has got several options for dining outlets.The members of the Gordon enclosure can enter the Lennox enclosure. This is the extremely relaxed enclosure. It has got playgrounds for children, and the families can come here for picnics. The enclosure has got lush green graces and food joints. No alcohol is allowed inside the premises. It is a great spot for picnics. The horse racing events continue for nineteen days from April to October. An unforgettable experience is given to the people by organizing the most famous and entertaining events having the combination of racing and music and best food facilities. The glorious Goodwood even which is also known as the Qatar Goodwood festival is the show stopper of the events. The Goodwood horse racing results today are easily available in the scoreboards. Sharpe at two pm the Hamilton Park is conducting the 50th anniversary of the novice auction stakes of the lockton companies. 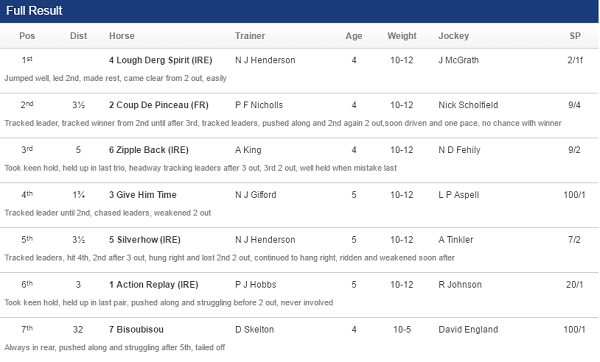 You can also get the Goodwood horse racing results today in the course guide. You can make the most of the day in Goodwood if he plans accordingly. There are lots of things which can be viewed in Goodwood estate. You cannot miss the famous betting involved in the Goodwood horse racing events and the race horses galloping with the ground under you getting trembled. You can enjoy the awesome delicacies in the restaurants with your family and friends. The Goodwood also makes the events more happening by incorporating the musical nights where you can dance your hearts out. The Goodwood has got the famous dress code which makes you look elegant and classy. It is popularly known as the Goodwood style. In the Richmond enclosure, the ladies can wear the summer dresses that would give them the classy chic look. You can also experiment with the various vibrant head gears that would make you stand out from the crowd. For the gentlemen, they require wearing a jacket and a tie. The season finale is one of the most awaiting events in Goodwood horse racing. For the year two thousand sixteen only one twenty-eight day are left. The season finale offers the spectators to enjoy fascinating horse races before the winter break. It is that time of the event when the participators make the most out of the last seven horse races. The race goers are provided with ample of facilities to enjoy the treat and make it grand. There are several packages which you can buy to enjoy the whole fascinating with your friends and families. The packages vary according to the enclosure you are choosing. In case you are interested in getting more information regarding the Goodwood horse racing then you need to me the active member of the estate. For the new members, it would cost four ninety-four pounds on an annual basis. Whereas for the young members who are between the age of 18years to twenty-four years, they will have to pay one sixty pounds annually. The members can have access to all the events of the year and can enjoy all the facilities and musical events and the racing with great fun along with their families and friends. The Goodwood estate has become very popular among the people due to its elegance and rollercoaster of events that are held.